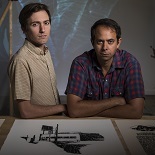 In November, our new work initiative, Alley All New, will present the performance lecture A Landing on the Bayou by Houston-based artists Nick Vaughan and Jake Margolin. 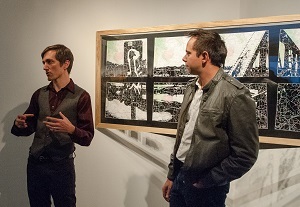 Fascinated by the true stories told by Nick and Jake, Liz Frankel, Director of New Work, discovered the piece along with James Black, Interim Artistic Director, at midtown’s Devon Borden Gallery back in May and quickly devised a plan to bring the piece to the Alley. The piece can be described as a multi-media artist’s lecture/performance exploring Houston’s diverse, rich and political drag scene in the years between the Stonewall Riots and the beginning of the AIDS epidemic (1969-1985). Drawn from audio recordings of interviews the artists conducted with a wide range of community members, this body of work celebrates the legendary and amateur drag performers, who collectively set the stage for Houston’s role in the LGBT rights movement, and held the community together during the darkest days of the crisis. We will offer two, 60 minute presentations of A Landing on the Bayou - November 8 and 9, both at 7:30 p.m., followed by a reception and the opportunity to view The Scene, an art installation with works connected to the performance lecture. Recommended for mature audiences. Please reserve your free tickets and read more about the piece here.